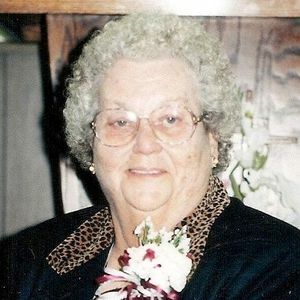 BELTON - Pansy Bell Cain Baynes, 83, of Belton, died Monday, June 18, 2012 at 12:33AM at Muhlenberg Community Hospital. Mrs. Baynes was born August 15, 1928 in Muhlenberg County. She was a machine operator at a sewing factory, and was a member of Belton Beechmont General Baptist Church. She was preceded in death by her husband, L.T. Baynes; daughter Lois McElvain; and brother B.C. Cain. Survivors include her daughters, Jean Fleming of Beechmont, Barbara Shepherd of Belton, Judy Miller of Belton, and Penny Clack of Powderly; 13 grandchildren; 17 great-grandchildren; 3 great-great-grandchildren; brother L.R. Cain of Belton; and sisters Joyce Arnold of Dotsonville, KY and Ozell Young of Lewisburg. Funeral services will be Wednesday, June 20, 2012 at 2:00PM at Tucker Beechmont Funeral Home, with Bro. Bobby Allen officiating. Burial in Forest Grove Cemetery. Visitation will be Tuesday after 5:00PM at the funeral home. Online condolences may be made at www.tuckerfuneralhomes.com. I remember when your parents lived at Riverside at Fred Rock;s mine. I lived up the road from you. Your mom would cook dinner and you girls and I would have a picnic of what she cooked, whether it be pinto beans and corn bread or biscuits and jelly. I have such fond memories of Jean , Barbara and Lois. She was a very nice lady , to a little girl from up the road. Pansy sure did mean a lot to all of us ( family of R.B. (Pete )McElwain). I looked forward always to seeing her in church as long as she was able to come. I knew I would get a hug if Pansy was at church on those special occasions that I came.